OTTAWA, Canada -- Russia is calling Ottawa’s decision to send 200 military trainers to Ukraine “deplorable” and “counterproductive” to finding a political solution for the conflict. Defence Minister Jason Kenney says Canadian military trainers in Ukraine will be nowhere near the conflict the eastern provinces. In a statement, the Russian embassy in Ottawa said the two-year training mission will not help in ending the “fratricidal” conflict between Kiev and eastern Ukrainian rebels, who are supported by Moscow. “It would be much more reasonable to concentrate on diplomacy and encourage authorities in Kiev to finally enter into a genuine political dialogue with Donetsk and Lugansk Republics as it was agreed upon in (the) ‘Minsk-2’ accords in February,” the statement read. Prime Minister Stephen Harper announced Tuesday that 200 Canadian Armed Forces personnel will deploy on a noncombat mission in Ukraine for up to two years. The Canadian troops will join U.S. and British forces training Ukrainian soldiers in a wide variety of skills, including medicine, bomb disposal, and flight safety. 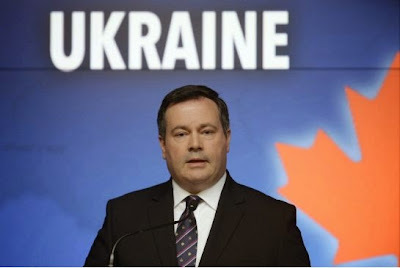 Unlike the noncombat mission in Iraq, which “evolved” and resulted in Canadian troops close to the front lines, Defence Minister Jason Kenney said the trainers will be nowhere near the conflict in Ukraine’s eastern provinces. Instead, they’ll be conducting the training close to the Polish border in western Ukraine. Paul Robinson, an expert on Russia and Russian military history at the University of Ottawa, said he doesn’t believe Canada’s involvement will have any major effects on the political talks between Ukraine and Russia, being brokered in large part by Germany and France. “The Russian communiqué today is a little stronger language than what’s been said in the past . . . (but) I think that’s generally how they view it: we don’t think it’s helpful, but it’s not something which requires us to escalate in turn,” Robinson said. Robinson said he suspects that there’s domestic politics in play for all parties — including Canada and Russia — in their response to the conflict in Ukraine’s eastern provinces. The conflict is now more than a year old. Since rebels stormed government buildings in Donetsk last April, an estimated 6,000 people have been killed. Hope for a political solution was rekindled after February’s announcement of a ceasefire, although the partial truce has shown signs of deteriorating recently. Between Monday evening and Tuesday, six Ukrainian soldiers and one rebel fighter were killed near Donetsk. Ukrainian officials said another 12 soldiers were wounded, as were five rebels.